A South African braaivleis (BRIGH [like high] - flayce, lit. 'roast meat,' but meaning barbecue) is nothing without boerewors [BOO-ruh-vawrs, farmers sausage]. 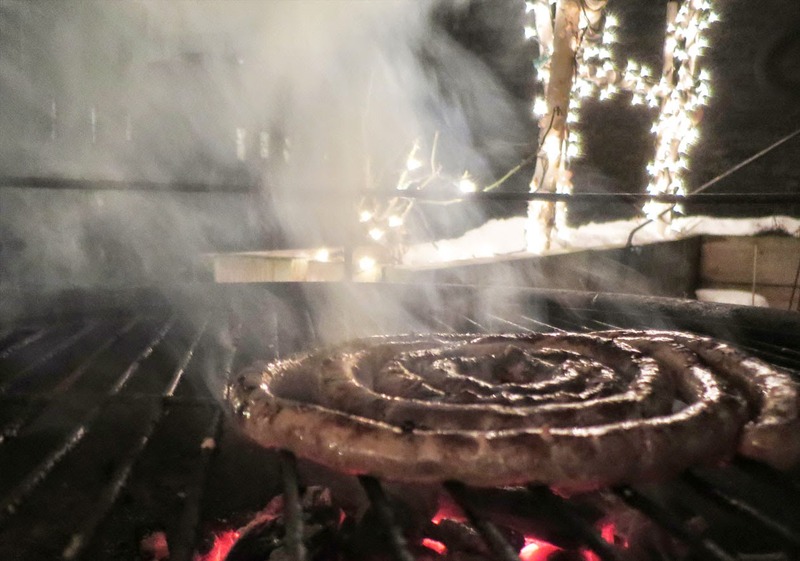 But boerewors is close to impossible to find in New York, and when you do, it's not great. It amazed me that this ubiquitous South African sausage, available in every supermarket and butchery and corner joint in South Africa had very few recipe-references, online. One cut and paste job was everywhere, I dug deep, experimented, and we took delivery of many batches. 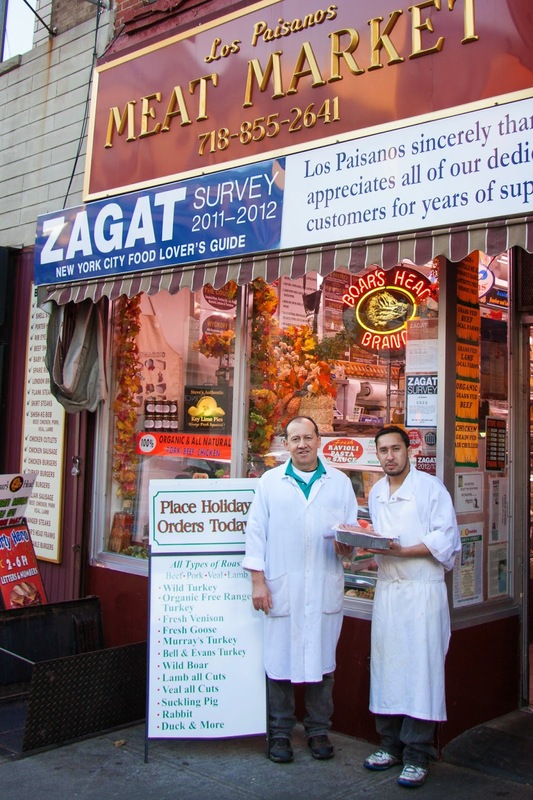 I ground and mixed the spices myself and delivered them to Los Paisanos, our butchery on Smith Street in Brooklyn, where the sausages are still made for us, for a minimum order of 6lbs (we order 12lb, when we are feeling flush). We worked our way heroically through coils and coils of sausage, becoming neurotic in our analyses of texture and taste. Back in South Africa we chewed with squinty eyes on delicious local sausages, comparing, judging, fattening visibly. Pedro Franco of Los Paisanos mixed up the first batch for me in October 2010, and then Ivan Palma started to help. They discovered that marinating the meat overnight with the vinegar and spice mix yielded a superior flavour. The previous version of the recipe below (since tweaked) yielded good sausage, and was given the seal of approval and published by Go (Weg) Magazine (Media24, South Africa). But I still felt something was missing. I fetched the most recent iteration from Los Paisanos a few weeks ago and my most recent spice mix produced the best sausage yet, at least for our tastes. The difference? More salt, more coriander, and a tablespoon of baharat, a Middle Eastern spice mix I had leftover from some Ottolenghi meatballs. Go figure. It contains many of the traditional boerewors spices plus some extras. So I isolated those and they are the optional extras for this recipe. About the spices: if you omit the garam masala and the asterisked spices you'll have the basic boerewors recipe. It's good. But with the cumin, cardamom, cinnamon, it's epic. It's not complicated to mix spices at home if you have all the individual spices on hand. I use a coffee grinder for mixing and seal the results in a jar, where it keeps for months. You could use either beef or lamb, but you must use the fatty pork. This is a fine grind and we ask for lamb casings. If you make your own, marinate overnight. In a hot pan singe the coriander very lightly and then grind into powder. Add the other dry spices, mix, and bag. Hand this to your butcher, with the bottle of malt vinegar, and say, Please. 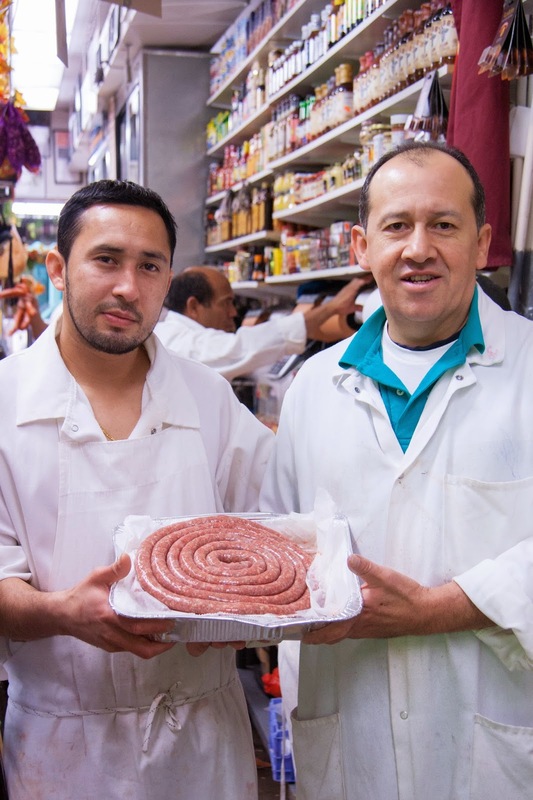 Los Paisanos will make this sausage for you, IF you commit to a minimum order of 6lbs and IF you bring your own spices and vinegar. Ask for "the South African Sausage," and for Ivan or Pedro. Tell them Marie sent you. Any chance you remember how much they charge for this? Anonymous - It was in the realm of $10 per lb. This is not a traditional boerewors recipe. 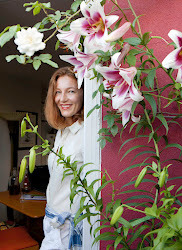 No plaasboer would dream of using garam masala or malt vinegar and the method is faulty. So, grootbek Plaasjapie - what's a better recipe? Since our dream of eternal white supremacy died on us, we plaasjapies are to be found everywhere. And believe me the world is not a better place for this diaspora. I will supply a recipe. For the moment, let me say that the clove/coriander ratio is crucial, toasting the coriander is heretical, and boerewors is not a fatty sausage. And then there is the matter of steeping the mixture. OK, Plaasjapie - I await your recipe with baited breath. It was a real boer who told me to toast the coriander though, so your heresy is not his heresy! I think you'll find as many opinions on boerewors as people who make it. And I have eaten a lot of boerewors. Nog 'n ding - this does not yield fatty sausage. At all. If anything, it's a tad on the dry side - maybe because modern pigs have less fat? In the meantime, I have put in a request to Vereeniging for a very old wors recipe, and can't wait to see it. Plaasjapie is all talk it would seem .. So I can just walk in to Los Paisanos on any given day and they will have boerewors ready for me to buy? If so...dan is al my gebede verhoor. I've been in NY for 7 years and have not been able to come across boerewors. Hi Lizanne - no, you either take this spice mix to them - which is easy to make; or you order ahead. What would you reccommend (weight) of an average piece for "first-timers" please ? I am introducing several Frencg friends to the joys of braiing. Hi Jerry - this makes 6lbs and one coil is roughly 1lb. I would braai one coil for two hungry people. 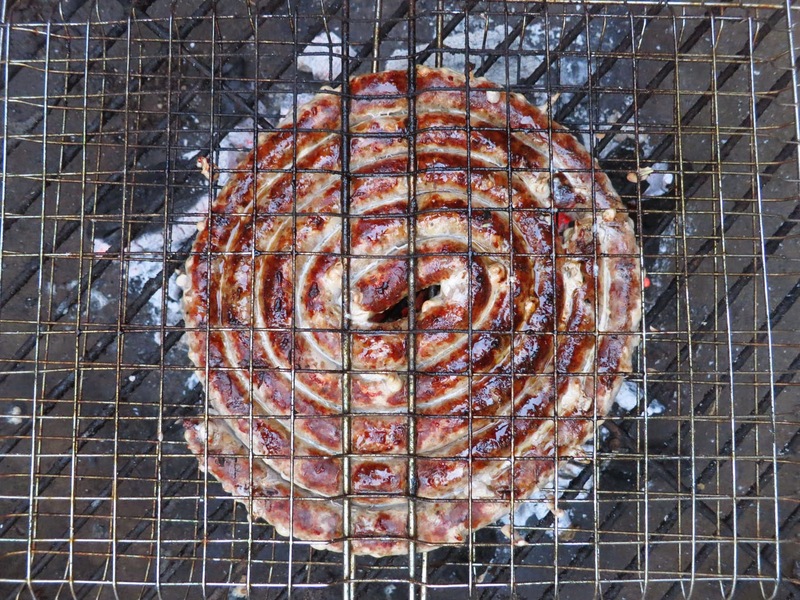 or if there are also chops and other goeters on the braai, one coil could be split amongst four. After living in Australia for 7 years and some one making a killing from real badly manufacturer wors , which I refuse to waste my monies on , I took your recipe to my butcher who so kindly minced my meat and then sent me on my way to make my own sausages . But as I am happy to eat wors raw , the taste was as I remeber from RSA and I was never a big eaters. So maybe after tonight there will be a bunch of happy South Africans in my suburb. I already supply them with Biltong on demand. And as you know Marie, I continue to make my own here, albeit with more coriander than the original recipe I sent to you. I share the above Saffa's problem with Oz wors. But even worse, it is made by "The British Sausage Company". Kan jy dit glo??? This alone was insult enough for me to start making my own. Looks good Marie, thanks for tips. However, as this Canadian sits quite full of boereworse in his Cape Town condo, I need to suggest caraway seeds. I really am no expert, but the sausage i just pounded back (fortunately nobody was here to watch) was both delicious - AND full of caraway seeds. Caraway...interesting. Sounds quite like 'Italian' sausage here in Brooklyn. Woah - cardamom is powerful. How funny. Did you like the result? With oodles of tomato sauce and krummel pap, let's just say it was...er..interesting. Still have 6 meatballs left coz husband couldnt stand it so will try to mash it into some tomato-pasta-bake of some sorts. Ag, shame. 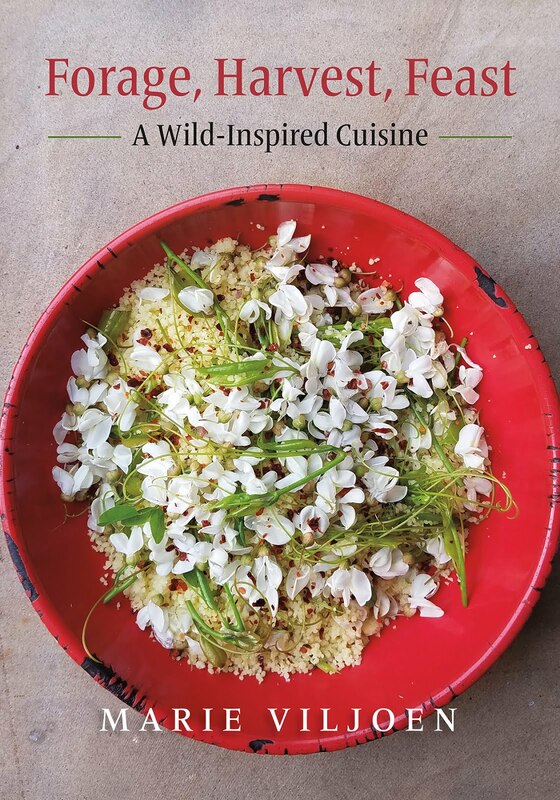 Well, it was a valiant effort, but I can imagine the cardamom would be overpowering, Why don't you turn it into a curry or Middle Eastern dish, instead? Hello Anonymous - where do you live? That is why it is such fun to come up with recipes. 100 years ago (1915) the East Indian spices were easily available (and long before, as the spice route is the reason colonial South Africa exists) and the basic spices you mention are in the recipe above. Hi Sue - if no pork belly substitute 1/2 pork fat and 1/2 lean pork. Most recipes just call for pork fat, but I find that too fatty for my taste (and I like fat). 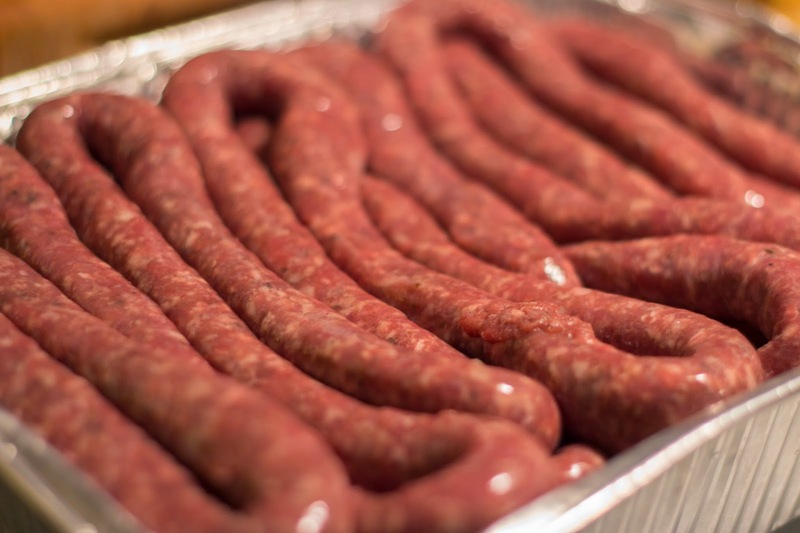 I have used your recipe now a couple of times and have made about 10kgs of Boerewors. The real test was feeding it to my wife's extended family in the UK all of whom are ex Rhodesians. Thumbs up all round. Thanks again for posting it. Chris. Hi Chris - I am so glad to hear that! Thank you for coming back to let me know.